Janome 3160 QDC is a good quilters machine. But some issues related to bobbin case can work as a limiting factor. Only moderately recommended. 3160 QDC is designed with quilters in mind. This machine features 60 built-in stitches which include 6 one-step buttonholes. The machine feeds with Janome’s unique SFS which ensures consistent stitch quality. This is a fully computerized sewing machine. It definitely has a premium look to it. It has a start/stop button and speed control slider, which means you don’t really need to use the foot controller to sew. It features an automatic needle threader.Janome 3160 QDC also has a built-in thread cutter which cuts the thread with just the push of a button. The thread cutter provides a nice, clean finish. The machine comes with memorized needle up/down feature which is a very important feature required by quilters. It comes really useful while pivoting. Auto lockstitch and reverse button are also provided. A lever is provided for dropping feed dog. Backlit LCD screen is where you will view all the controls and settings. Arrow keys are provided for stitch selection and adjustments. The bobbin is top drop-in type which makes it very easy. There is an automatic bobbin winder as well. Another good thing about Janome 3160 QDC is that the presser foot pressure is adjustable. The machine is free arm capable. The machine can sew 820 stitches/min (just decent, not the best by industry standards). An LED work light is also provided. Horizontal retractable type spool pin is an added advantage. This machine weighs 12 pounds and there is a built-in carry handle to make it portable. Portability is a huge factor especially when you want to take your machine to sewing classes. The machine comes with an awesome extension table which is really handy while working on large projects. The extension table even has retractable legs, so that you can easily carry it to your sewing class. Janome 3160 QDC comes with a 25 year limited warranty. It includes a hard cover as well. 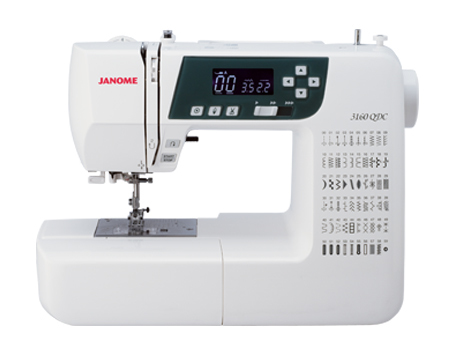 Janome is known for its reliability and 3160QDC is no exception, but it is not without problems. The machine is lightweight but it doesn’t move around on the table. The stability is something that really impressed me, especially for a lightweight machine like this. It is a great machine for quilting purpose. Too many layers of thick fabrics is not something that will work, it seems. When you sew with multiple layers of denim (6 plus), the thread gets stuck. It works flawlessly on all other types of fabrics. The automatic thread cutter is fantastic. It works like a charm. The extra large extension table is very useful for large projects, it will be hard to sew on machines without the table once you get used to this machine. It is an extremely easy machine to use as everything can be changed by the push of a button. The sewing light leaves a lot to be desired. It is that dim. The dim light is not the biggest issue with Janome 3160 QDC, there is another problem that many users have pointed out. The thread gets tangled under the bobbin. Normally you won’t see such issues with Janome machines but some users definitely had some trouble with it. If you take out the issues I said in the limitations section, it is a champion machine. But when you hear about the bobbin case problem and issues like that, you may get skeptical about the machine. When you ask people who use Janome 3160 QDC, they have mixed reactions. Some say it is wonderful, other say not so good. Ultimately, it is a decision that needs to be made at an individual level. Other alternative machines I can suggest are the Janome 5100 and Janome DC2014. Janome 5100 is much more advanced than 3160 QDC. It has 167 built-in stitches and has options to store 50 design patterns. All other features are the same as 3160 QDC. It is a highly rated sewing machine. Janome DC2014 is another machine that has some excellent feedback from its users. It has 10 less built-in stitches when compared to 3160 QDC, but it is a workhorse. It can sew through anything you throw at it. It is an awesome, computerized sewing machine. The features are almost the same as 3160 QDC.